Military hardware is really, really, really expensive. Insanely so, given that the official NZDF forecasts envisage no credible military threat to this country over the operational lifetime of the gear currently in line to be purchased. 66. New Zealand does not presently face a direct threat of physical invasion and occupation of New Zealand territory. The likelihood of such a threat to the Cook Islands, Niue, Tokelau and territory over which we have a sovereign claim, emerging before 2040 is judged to be very low, and would be preceded by significant change to the international security environment. New Zealand could therefore expect to have a reasonable amount of time to re-orientate its defence priorities should this be necessary. 67. Although there is no direct threat to our territorial integrity, New Zealand faces a range of other threats from state and non-state actors, including cyber threats and terrorism. While it has nominally signed on to the $20 billion NZDF equipment wish list, the Ardern government has said that the business plan for each item will be judged by Cabinet on a case-by-case basis. The State Department has made a determination approving a possible Foreign Military Sale to New Zealand for P-8A aircraft and associated support. The estimated cost is $[US]1.46 billion. The Defense Security Cooperation Agency delivered the required certification notifying Congress of this possible sale on April 27, 2017. 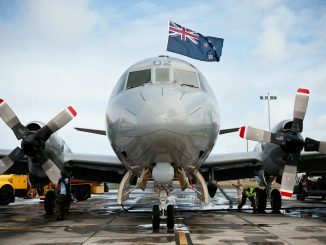 New Zealand has requested the potential sale of up to four (4) P-8A Patrol Aircraft…..This proposed sale will enhance the foreign policy and national security of the United States by strengthening the security of a Major Non-NATO ally which has been, and continues to be, an important force for political stability within the region. …. Right. So we have readied ourselves to spend $US1.46 billion – which is about $2.14 billion in today’s NZ dollars – on four Boeing P8A Poseidon aircraft. That’s before we get into the added operational expenses this purchase would entail, from training on the new aircraft to aerodrome refits (the planes would be moved from the shorter runways at Whenuapai to Ohakea which would require a runway extension, regardless) to hangars for the Poseidons to the gear and personnel to process all the information that the new planes managed to gather. All up, the taxpayer could end up parting with the best part of $NZ3 billion to provide only one element in the new Defence configuration. To put this in perspective: replacing the P-3K planes with Poseidons is budgeted to cost three times (at best) and six times (at worst) what the nurses’ pay claim has been estimated to cost over the next two years. Obviously, the colossal amounts envisaged for Defence will be spread out (as much as is humanly possible) over the coming decade. Just as obviously though, the eventual cost of the Orion replacement alone – which to repeat, is merely one item in the mooted $20 billion cost of replenishing our military hardware – would utterly transform the New Zealand health system, rebuild our mental health services, and modernise our education system from pre-school to tertiary level. Yet for now, both major parties seem to be taking the Defence wishlist very seriously indeed – even though what the nurses and teachers are seeking in this year’s pay rounds has seen the politicians shaking their heads and pleading for patience. The next concrete signal of what the coalition government has in mind will come when Defence Minister Ron Mark unveils the NZ Strategic Defence Policy Statement Document at Victoria University on July 6th. Oh, and one other thing. Maybe we don’t need to buy Poseidons (or at least buy multi-purpose new Hercules planes instead) to upgrade our current maritime surveillance and anti-submarine capability. That’s because on Monday, Australia announced its intention (a) to spend $A7 billion on buying a fleet of six high-tech US Triton drones to carry out maritime surveillance and anti-submarine detection in the Pacific Ocean/Indian Ocean/South China Sea regions, while (b) also saying that it plans on sharing that information with its 5 Eyes partners, which of course, will include New Zealand. The drones will complement the work of Australia’s own Poseidon aircraft and will become fully operational in 2025, which is exactly when our Orions are due to be replaced. Point being: how much duplication of the maritime surveillance and anti-submarine detection of the Asia/Pacific region do we need, given the massive costs involved? And if that sounds like freeloading to Canberra… our government should be reminding them think of all the money we will be pouring (as a virtual cross subsidy) into the pockets of the Australians when it comes time to replace the ANZAC frigates. At some point, our Defence costs surely have to be put on a rational cost/benefit footing. We can’t afford to continue rolling over defence configurations that were devised during the Cold War, and then gaily pay whatever cost that entails – simply because that’s how we’ve always done it, and because our defence boffins like to carry out joint military exercises with their customary allies. After all, as the 2014 Defence Assessment I linked to above says, the real dangers to this country’s autonomy and economic wellbeing are from cyber threats and terrorism – and yet bizarrely, there’s almost nothing on the current $20 billion Defence wishlist that will equip us to combat those kind of threats. Footnote: The usual measure of our Defence spending (and this is routinely presented in a context where we are being exhorted to spend more) is to present this as a percentage of GDP, against which it looks very small indeed, at 1.1%. Australia’s comparable figure is 2%, and the United Kingdom figure is 1.8%. But is this figure – which measures defence against a GDP figure that includes private sector wealth generation, really the most accurate measure of a government’s commitment? Surely, a more appropriate figure is the ratio of defence spending to government spending – which reflects just how Defence is faring against other calls being made on the revenues of the state. When we use that figure – and the link to the relevant Excel spreadsheet is available here we find that our current expenditure on Defence constitutes a far more respectable 3.3% of all government spending, and is not all that far behind the 5% allocated by Australia. In the Oceania region, everyone lags behind Fiji’s 5.8%, which only goes to show just how meaningless these kind of comparisons are. Earlier this week, Slate accurately predicted the retirement of US Supreme Court judge Anthony Kennedy, who in recent years has liked to think of himself as the reasonable, moderate bridge between the Supreme Court’s conservative bloc and what remains of its liberal wing. However, Kennedy’s presence didn’t stop the likes of previous Trump appointee Neil Gorsuch from swinging the Supremes in behind two awful decisions this week – one legalising Trump’s anti-Muslim travel bans, and the other dealing a body blow to US labour union rights. With Kennedy choosing to go, Trump can now appoint another Gorsuch clone, and thereby enable the Court to deliver the full wishlist of the Christian conservative right. LGBTQ rights, the boundaries of free speech and the right of labour to organise collectively will all potentially be on the chopping block. Even the overturning of the 1973 Roe v Wade decision (on which the abortion rights for US women depend) will become possible. If further evidence was needed as to why Trump’s 2016 victory has been a disaster, this virtual abolition of the Supreme Court as a check and balance on presidential power should be enough to convince even the most bone-headed Hillary haters on the left. Looking ahead, if 85 year old liberal justice Ruth Bader Ginsburg had any plans for retirement, Kennedy’s decision to bail out – and his resignation letter addressed to “my dear Mr President” – should postpone it. Not that whatever Ginsburg or her liberal colleague Sonia Sotomayor say will make all that much difference in future. Whatever happens to Trump in 2020, he has been given the power to shape the direction of America’s highest court for decades to come. Mitski Miyawaki’s outstanding 2016 album Puberty2 set a high hurdle for her to emulate, and the “Geyser” single a few months ago was an unexciting preview of her new material. This week’s “Nobody” cut is more impressive, and the video underlines the disembodied use of the playful ‘no body/nobody’ word games contained in the lyrics… Have fun. NPR’s Tiny Desk concerts have long been a wonderfully concise 20 minute showcase for new and emerging talent, and that’s included Angel Olsen, Sylvan Esso and Anderson Paak (to name only a few) in days gone by. This recent concert by the young Canadian neo-soul musician Daniel Caesar is as amiably enjoyable as Paak’s, and with just as many ultra-tight musical highlights. Finally, here’s Daniel Caesar on the Colbert Show, performing a stunning new track alongside Chance the Rapper.